How's that for inspiration? Can art be inspiring? Can watercolour art be inspiring? Well, I think it can. Take a look at this piece. See how calm the surroundings are. The undisturbed reflection of the river flowing through secondary jungle. Did you hear the birds sing? There is no wind. Just cool surroundings. Makes you wish you were here, right? So peaceful and quiet. Nature at its best! I was inspired by the water flowing in that river. Only watercolour can give this kind of effect. 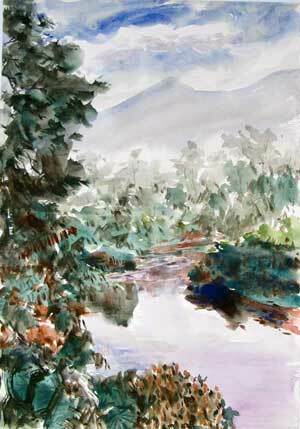 Only watercolour can capture of water because of its transparency. Hope you like this one.